DadTalk: Goodness, What Are We Going to Do With All That Candy? to Do With All That Candy? It’s been 27 years since the last time I went Trick or Treating. It hasn’t changed much, though now that I’m a dad I no longer get that weird feeling of “wrongness” right before knocking at each door. 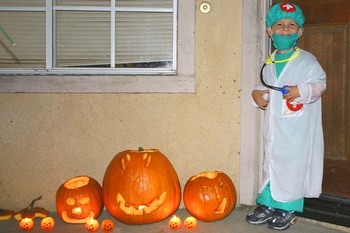 I explain to Seth, who is dressed like a doctor, that he needs to say “Trick or Treat” as soon as the door opens. On cue, Seth says the magic words to the neighbor, whom we know. Seth walks directly into the living room as if he owns it. I apologize to the neighbor as it dawns on Seth that this is all about candy. For the next several houses, Seth continues to walk straight into the living room. It’s been so long since I’ve gone out on Hallows Eve that I forgot how few houses actually respond to the doorbell. In our own subdivision, about 50 percent of the homes were open to children. Some people were just late getting back from work, but many could be seen moving around in their homes turning off the lights when we arrived at their door. After several more homes without incident, we visit another friend’s home. An older child is wearing a rubber monster mask and Seth becomes palpably frightened. I realize I should have warned my boy that some people wear scary costumes. We begin to predict whether each house will have scary people in them or not. None do, but unfortunately, the next six houses have loud barking dogs, which put a much bigger fright into Seth than the costumes. I have a more difficult time getting him to say “Trick or Treat” and “Thank You” for the rest of the night. When the freeway was built, the state paid for electronic gates at the entrance of our subdivision. This dramatically reduced the number of Trick or Treaters in recent years. Apparently, our neighborhood was popular with young families because the houses are crammed together. One side effect of fewer kids is people who did answer dropped two to three times as much candy in Seth’s bucket than I ever received as a kid. On the other hand, I received a wider variety as a boy. Seth is getting thirsty, so we stop back at the house. Besides, his bucket is so heavy he can barely carry it. We pour out the candy onto the table and we let him pick out one piece. Seth is so young and unaccustomed to candy, that he can’t even finish a Kit Kat. Virtually everyone we met was friendly. One poor house, which was in a sea of dark ones, apparently was overlooked by other kids. When we stopped there, Seth must have received 15-20 pieces of candy. The occupants tell me that we were the first people to stop by, even though it was already 8 p.m.
Seth is getting bolder again, especially when we hook up with two five-year-olds. While the two kids sometimes lollygag before a door, Seth boldly goes up and rings the bell. And Seth starts taking great big handfuls of the proffered candy. One homeowner just lets him keep going and going until finally I have to tell Seth that’s enough. Overall, the experience was great both for me and Seth. The only problem: Seth received more candy than we actually bought, much of which is downstairs on the coffee table. I suspect my co-workers will soon be begging me to stop bringing in candy. Great story... It reminded me of when we bought our first house, nine years ago, and could finally hand out candy to trick-or-treaters. I bought this really horrible mutant mask and answered the door with it about five times before I took it off to stop making the little kids cry. Actually, it was kind of funny... One boy even heard about me: I opened the door without the mask and he said, "Hey, his mask isn't that scary-lookin'!" You guys have a definite advantage over us... It was in the 40's Halloween night, which wasn't so bad except a cold drizzly rain started up around 6:30. Still, my kids didn't let that stop them from soldiering forward. weather here was beautiful. But we didn't get as many trick or treaters as usual and have ended up with a lot of leftover candy. I just brought it into work and put it out in the lounge, hope my coworkers enjoy it! My co-workers have already eaten more than half the candy I brought in. Wow.